Over the course of the last two months many have been concerned with the threat of North Korea’s nuclear program, Hurricane Harvey, or even issues with Russian relations and the Trump administration. While these issues are important, another large issue seemed to fly under the radar of most Americans. The issue of net neutrality has been called into question again and the FCC could roll back on decisions made in the Obama administration. In recent months, the Commission decided to reevaluate the current precedent on the issue. Net neutrality does sound boring, and frankly it can be, which is why many fail to pay attention to its importance in our daily lives. In fact, the issue has been called “the First Amendment issue of our time” by Senator Al Franken. Net neutrality is important to our democracy because it concerns open access to the Internet and the ability of the public to stay informed. The first debates over net neutrality happened back in 2014 when the issue first affected many Internet users and the company Netflix. At its heart, the issue of net neutrality has to do with Internet Service Providers (ISPs) being able to discriminate and throttle speeds for certain websites or applications at their own will. In early 2014, as this graph notes, Comcast slowed the speeds of users accessing the website Netflix for their streaming service. Comcast essentially held the traffic of Netflix at ransom until Netflix paid them some amount of money, which has not been released. After Netflix paid up, their speeds were back to normal. Now, this doesn’t seem so horrible, right? After all, Netflix takes up huge amounts of bandwidth on Comcast’s network and can afford to pay Comcast given the size of the company. The issue arises when a new startup wants to create a streaming service like Netflix but cannot afford the barriers to entry to stream at the speeds of Netflix on Comcast’s network, even if the new company’s service may be better. People by and large will not buy into a service that would be demonstrably slower than Netflix, even if the service is better by all other counts. It does seem hard to believe that some startup could even compete with Netflix down the road, but Internet startups seemingly happen overnight and it is possible that Netflix could be put down by a new service. After all, MySpace was brought down with the advent of Facebook and Pandora has been replaced with Spotify in more recent years. This issue concerns not only the financial situation of businesses, but your personal bank account as well. The other front to this issue is one that would directly affect your access to the Internet, mainly in terms of how you purchase internet service. If the FCC were to relax regulations set forth in the Obama administration, ISPs like Comcast and Verizon could sell Internet service much like Cable Television is sold in America with tiered pricing for access to certain sites. 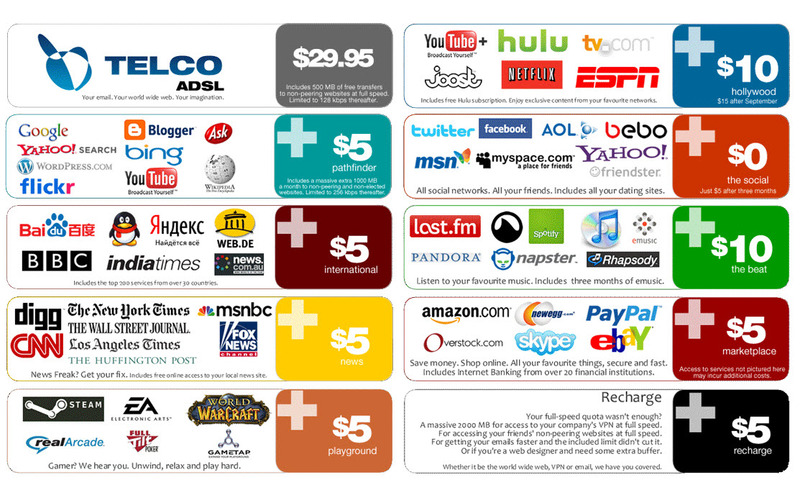 Essentially, your ISP could require you to pay a premium to access Netflix or The New York Times, things which you already pay a service fee for. This potential reality is theorized in this graphic. ISPs might claim they would switch to this model to save customers money and make the internet open for more people because it could lower the general cost to gain internet access for the most basic levels of service. This is exactly the opposite of what would happen, especially if ISPs used the model in the above graphic and charged people a service fee to access news websites. The Internet as we know it today would be changed and access to lots of information would be limited for those with a very basic subscription. In this way, the issue of free and open internet is directly related to freedom of the press. Just this month, the Pew Research Center released data that more and more people are headed to the Internet to get their news. With more people relying on the Internet to get their news, the last thing we need is another barrier to access that information. This would be a change that would happen over a longer time period, but changes could be happening much sooner. ISPs like Verizon and Comcast are, of course, opposed to their designation as Title II Common Carriers, which allows the FCC to regulate them heavily. They were classified as Title I before 2015, meaning that the FCC had much less control over their actions. The fact that the FCC is still working with categories set by the 1934 Telecommunications Act, passed in a time when legislators did not have any real understanding of the Internet because it didn’t exist, is extremely limiting. They’re working with a system that isn’t adequately designed to regulate the Internet. Under Title II, the FCC can properly regulate ISPs in terms of this net neutrality debate, but they have more control over ISPs than necessary as they can effectively change market prices and limit where they can expand. A change is necessary so that the FCC can continue to secure a properly open internet (i.e. secure the current rules on net neutrality) but their potential to regulate other aspects of providers is a vast overreach into the market. In short, the FCC can maintain the current net neutrality rules while ISPs are listed as under Title II, but they have greater control than necessary in other aspects over the market. The time the FCC has allocated for comments on their proposal reexamining net neutrality is over. However, that does not in any way mean the issue has passed, and only once the FCC has released their decision on if they will change their regulations on ISPs will we know for sure if net neutrality is safe.